But how did he get there? To find out we need to go back and relive some of the events leading up to poor Matus’ demise. After stopping by 1924, where young Matus runs his own marathon, a shadowing of the event happening over at the Paris Olympics, we return to the day he is dismissed for his radical views and decides to embark on a quest. He declares that the accursed Gringos have squatted on Mexican land long enough and calls for a group of brave souls to assist him in his mission to reclaim Texas for the mother country. Most simply ignore his rants, but one group of very special people sees a chance here to write their names into history, and the Enlightened Army rides forth, changing Matus’ life forever. 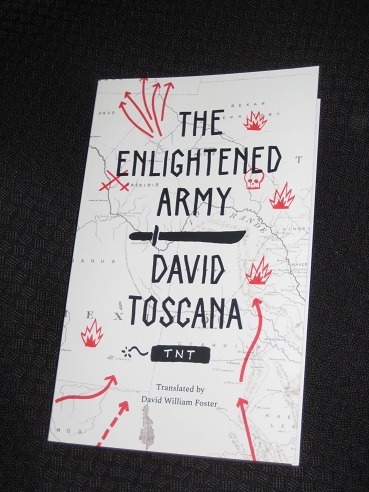 The Enlightened Army is an entertaining, at times farcical, tale, with the story jumping back and forth between the three principal time strands (1924, 1968 and the present day, where the narrator reflects on earlier events). It’s the tale of one man and his historical grievance, strengthened by a personal grudge, with his anger at not making it to the Olympics morphing into a quest to cross the border. In his mind, it’s perfectly reasonable to steal the territory the Americans stole from them, especially since they also took away ‘his’ medal. However, despite the initial focus on Matus, the real stars of the novel are the soldiers he recruits to his army. His younger brother, Fatso Comodoro, is mentally disabled, attending an institute every day. His is a fairly dull existence, so when he sees his brother’s recruitment poster, he’s eager to take up the cause, as are his friends. While the idea of invading the US might seem like little more than a fantasy, for the enlightened ones the line between reality and fantasy is unclear at the best of times. They really believe they’re off to retake the Alamo, or die in the attempt. Ubaldo says he was fascinated by the priest’s story about the body that dies and releases an invisible puff of smoke that flies up to a place of blue clouds and happy faces where it will live forever. Didn’t you see he was serious? That priest needs to be sent to the institute. You might think it’s crazy to take on the might of the Americans, but when the alternative is rotting away in glorified day care, you can see their point. It’s better to die in battle than colour your life away. The Enlightened Army isn’t just an amusing tale. Underlying the bizarre story is a subtle analysis of the relationship between Mexico and the US through its surreal comparison of the two countries. Matus’ hatred of the Gringo he believes stole his glory is representative of his country’s envy and resentment at past injustices. This is only exacerbated by the reality that there’s nothing they can do about it, and the Olympics, in which their neighbours will once again win the lion’s share of the medals, is just another symbol of the Americans’ superiority. Matus’ small team is a perfect example of the limited power of the country in the shadow of the Yankees, an impotent land dreaming of past glories. It’s also well written, with Toscana’s style notable for its blending of voices, achieved through a lack of quotation marks and speakers’ names. In addition, the constant humour contrasts nicely with the pathos of Matus, his country’s faded glory and the ragtag army. If there is a weak point, it perhaps lies in the marathon strand. It does tie affairs up nicely, and is an integral part of the story, but at times it can appear a little forced, a sub-plot to explain our hero’s motivation and help break up the main strand of the invasion quest.